Death by Food: Python Dies after Eating a Porcupine - 2NGAW! A porcupine is a small animal but most predators, even fierce lions, give it a wide berth because of its sharp quills. 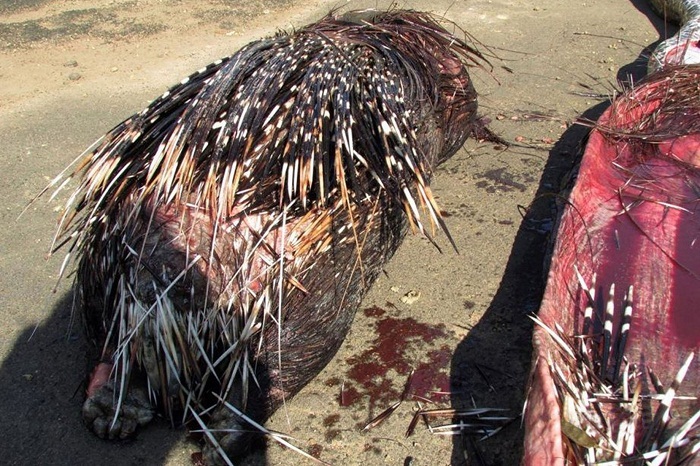 You would not want to mess with a porcupine or you’ll be struck with those painful barbs. One python, however, made the mistake of choosing a porcupine for its meal. Perhaps the snake had been hunting at night and did not manage to take notice of the spiky animal. We are not sure what exactly happened but some hours later, the python was lying dead by the road side. The 13ft African rock python fell on a cycle track at Lake Eland Game Reserve, near Port Shepstone, South Africa. Reserve managers who went to investigate were puzzled at first as to how the snake died but would later find the spikes piercing its digestive tract. According to Reserve general manager Jennifer Fuller, they still are not sure whether the snake died from the piercings before it fell off the rocky cliff next to the tract or whether the porcupine’s spikes pierced it after it had fallen off. Either way, it was the porcupine meal that ultimately became the reason for this snake’s death.